I don't play video games. I never have. I have, however, battled evil aliens in outer space. This may explain why I love The Last Starfighter. Of all the sci-fi and fantasy genre movies to come out during the 1980s, few are more charming than 1984's The Last Starfighter, directed by Nick Castle (a friend of John Carpenter, who is actually credited as playing "The Shape" in the original Halloween). It takes a simple story -- kid gets recruited to fight aliens in space -- and tells it well, providing likable characters and performances (including Robert Preston in his final film role, a credit slightly less dubious than Orson Welles in Transformers: The Movie) all set to a rousing space opera score. For a movie that should feel incredibly dated (what with its pioneering use of some incredibly early CGI and the fact that it centers on an ARCADE GAME), The Last Starfighter is, at its core, timeless. Though it may seem slight or inconsequential compared to the best ‘80s genre offerings, the movie’s inherent sweetness has kept it alive for decades. Alex Rogan (Lance Guest) is a normal teenager feeling trapped: he’s working as a handyman in the trailer park where he lives with his brother and mother and dating a girl (the adorable Catherine Mary Stewart, who belongs on the list of my '80s crushes alongside Ally Sheedy in WarGames and Elisabeth Shue in The Karate Kid) who’s not really interested in getting out and making a new life. His only escape is a video game called Starfighter, in which he helps “defend the Frontier from Xur and the Ko-Dan Armada.” After racking up the high score on the game, Alex is approached by a man named Centauri (Preston), the inventor of the game who reveals that Starfighter is actually a recruiting tool, and that Alex’s skill at the game has made him the number one candidate to join the actual Frontier. He invites Alex to join him for a ride, then quickly whisks him off to outer space and introduces him to the Rylan Star League, a group of aliens from a number of planets (except Earth; they’re not yet advanced enough) banding together to battle the real Xur and the real Ko-Dan Armada. Based on his skill at Starfighter, Alex is asked to take part in the fight and pilot a Gunstar alongside an alien co-pilot named Grig (Dan O’Herliy under heavy prosthetics). Alex will have none of it, though, and insists on being brought back home. Though Centauri is appalled that someone would turn down the honor of being a starfighter, he obliges and brings Alex back to the trailer park, where he learns that in his absence he’s been replaced by a “beta unit” (also played by Guest) -- an android double of Alex meant to cover up the fact that the real deal has gone missing. Back on Earth, an assassin in the employ of Xur attempts to kill Alex, but only damages the beta unit. Alex, realizing that Xur will keep trying to kill him and likely ultimately destroy Earth, decides that his only course of action it to return to the Star League and join the fight. When he returns, however, he discovers that Xur and the Ko-Dan Armada has destroyed the star base and wiped out the Rylan League. Only Grig is left alive, making Alex -- that’s right! -- the Last Starfighter. What makes The Last Starfighter ahead of its time -- and what has undoubtedly helped it earn its cult following among genre fans -- is that it makes being a geek heroic. Unlike some of its ‘80s brethren (including Real Genius, WarGames and The Manhattan Project), the movie suggests that you don’t necessarily have to be the biggest brain to save the day -- you just have to be good at video games. Of course, this was more than likely a deliberate attempt to cash in on the decade’s arcade craze (screenwriter Jonathan R. Betuel couldn’t have predicted the popularity of home video game systems), but that’s only if you’re a cynic. Or a realist. I am neither (I am both). It’s no more wish fulfillment than any other film; it’s just wish fulfillment for a very specific audience. That’s not to say that The Last Starfighter alienates the non-arcade junkies in the audience. To the contrary; it's the same universal hero’s journey that has made up storytelling and myths for hundreds of years, and, to that effect, the film offers no real surprises. It’s a great example of a familiar tale well-told, filled with real warmth, just the right amount of humor and tremendous affection for its characters (it doesn’t hurt that those characters are played by the likes of Robert Preston and Dan O’Herlihy, either). There’s nothing pretentious or unlikable about The Last Starfighter, and, unlike some other ‘80s genre fare, it never gets too bogged down in its own nerdiness. It’s the kind of movie that’s accessible to anyone. Besides, the movie does more than suggest that being good at video games makes you cool. It was the '80s. Being good at video games was cool; this was just one of the first pieces of pop entertainment to explicitly state as much. What's great about The Last Starfighter is that it suggests that it's not enough to just be good at video games. That may be a foot in the door, but it's not a real life. No, the movie argues that there comes a time to put down the games and actually do something -- to take real-world action, not just simulate life for $.25 a pop. That's a lesson that young people could stand to learn almost 30 years later, though I guess they're not entirely to blame; the entire world has transformed since 1984 so that we're all basically just living life behind video game (computer) screens. Even the military is more like a game of Starfighter than it was in 1984. What has really earned The Last Starfighter its spot in the history books is its use of early computer-generated special effects. Alongside Tron, Starfighter is credited with being one of the first movies ever to incorporate CGI; what made the movie ahead of its time in 1984 is precisely what dates it so badly now. The computer-created spaceships look boxy and cartoonish – nothing like the sleek, photorealistic effects that studios are able to achieve in 2010 (to think that we went from The Last Starfighter to James Cameron’s Avatar in a span of 25 years makes my head explode). Truth be told, though the special effects place The Last Starfighter within a very specific year and cinematic context, their blocky roughness gives them a real charm. It’s fun to see where it all started, and the movie is still good enough to support the novelty. A bunch of it doesn't work, of course. For a movie that takes place across an entire galaxy, it feels very small (sometimes, that could considered a compliment, but not in this case. If that's what I was going for, I would have said "intimate."). When the starfighters (read: Rebel Alliance) are summarily wiped out, leaving Alex as the LAST STARFIGHTER, the moment carries no weight. The villains are lame and generic. There appears to be some sort of hierarchy among the bad guys that we are not quite privy to, so while we think that Xur is the Big Bad, it turns out to be two alien guys called the Ko-Dan. We're not really even sure who to root against, which makes it tough to get excited once the battles start. It doesn't help that the fight sequences are poorly paced and lack any real energy; with the exception of a 20-second sequence in which Alex performs the "death blossom," there's nothing rousing or exciting about the action in the movie. This is a problem for a movie that's all about space battles. I don't care. Once Catherine Mary Stewart takes that ride up with Alex into his ship and the music swells, I forget my problems with the movie. Then Alex's little brother runs over to play Starfighter, and it's a really sweet moment (it's also positively Spielbergian the way it's shot). Then that black guy starts in with "Welcome to Hollywood! Everyone got a dream. What's your dream?" And I'm a goner. As JB says, there's no use arguing with the eight-year old me. But it's for more than just nostalgic reasons that I love The Last Starfighter. It's sweet and fun and sincere. It's a nerdy fantasy. It's a metaphor for growing up and leaving home. A call to action and for taking control of one's own destiny instead of just experiencing it virtually. A chance to see Catherine Mary Stewart in jean shorts. Beyond its obvious technical contributions to cinema, there are those of us for whom The Last Starfighter has lasting power. In a decade defined by excess and a genre that, at the time, was ruled by cheap, silly knock-offs of better movies, The Last Starfighter is a welcome change of pace, even if it, too, is a cheap and sometimes silly knock-off of better movies. It's sweet. It's good-hearted. It’s such a special movie. Thank you for this, Patrick. The Last Starfighter is probably my favorite movie from when I was a kid. I'm not sure if it's because it came out at just the right time or what, but I could watch it over and over quite happily (actually, I still can). I agree with a lot of your critique. The effects are rather dated (the landscapes are particularly bad). You're right that the wiping out of the Starfighters is weak -- though I've always thought the attack on the base was handled pretty well. I also wonder if the flatness of a lot of the action scenes is because they really didn't know what they could do with the technology and didn't have the time to tweak things once they were rendered. Xur is an incredibly weak villain (though his melting of that guy's head is pretty badass -- maybe he should have just stayed a giant projection of a head and never actually been seen) who just sort of disappears at the end never to be heard/seen from again. The Ko-Dan themselves are more formidable -- you have to admit that Commander Kril goes out like a champ too: "...we die." I've never been a fan of the Louis character (you almost expect Corey Feldman in that role) -- though I do love his moment at the end of the film that you call out as purely Spielbergian. I remember watching this movie again for the first time in a long while when I bought the DVD, and I was afraid of a Goonies effect happening, but it was nowhere to be found. I didn't care about ANY of the weaknesses of the film. I just sat back and let the nostalgia wash over me. I love love Robert Preston (perfect casting) and MAN does Dan O'Herlihy work it with that makeup. How he managed to emote at all in that get-up is beyond me. It's also fun to see Gul Dukat show up briefly before turning into a monster that did give me nightmares as a kid the first time I saw the movie. Finally, I have to give a shout-out to Craig Safan, who wrote one of the all-time best sci-fi movie themes this side of the Star Trek/Wars films. Thanks, Carl. I think this is that kind of movie -- really special to a group of people, pretty forgettable for everyone else. Good call on Louis. He is the worst. LOVE the music for the movie. I had the chance to see the movie in a theater a few weeks ago, and "We die" received a round of applause from the audience. Tons of fun. Nice article, Patick, and you certainly make it sound pretty great, but question: I'm pretty sure I did see this when I was younger but have absolutely no memory of it - is it still an enjoyable movie for an adult watching it in 2012 sans nostalgia-tinted glasses? "Patick" is what Patrick is going to legally change his name to so that I save face - thanks Patick! Looks like I'll have to give this a rent - trying to curb my blu-ray buying to must-haves and my crappy Netflix Canada doesn't have it to stream. I noticed they do have The Last Airbender so maybe I'll just watch that instead. I've heard it's AWESOME. I am nothing if not a team player. Sol, I didn't see "The Last Starfighter" until 2007 or so when it was released on HD-DVD (still have it, same transfer as the Blu-ray version). I've seen it a couple of times since and think it holds up well as a simplistic but well-told 'hero's journey' provided you don't walk in expecting it to work on you like "Back To The Future" did on Patrick back in '85. The 'being good at videogames' plot is a McGuffin (although the scene where the entire trailer community cheers Alex as he beats the game is very nicely done), an excuse to basically recruit a teenager from anywhere USA to be an unlicensed-by-Lucas Luke Skywalker fighting in a made-up, watered-down "Star Wars" scenario. Compared with 1985's "Enemy Mine" (a George Lucas-produced sci-fi action flick cut from the same cloth) this one has a heart and soul that go miles to compensate for its OK-but-so-dated SFX, unlike "Enemy Mine" where both the SFX and the assembly-line plot conspire to date the movie to the point of almost no enjoyment. 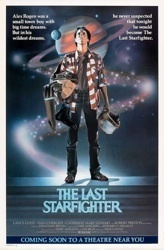 "The Last Starfighter" a nostalgia-soaked trip for some (an 80's Spielberg-like movie without Spielberg), but personally I don't think the 'Goonies' effect applies here because the movie plays with the same sincerity and emotional mileage that also powers 1999's "Galaxy Quest." Both are gently poking fun at a genre, but are also competent-enough examples of that genre (which back in '84 took a ton of money) to stand on their own. I personally like it because the supporting work of Robert Preston and Dan O’Herliy (who disappears into his make-up and doesn't give hints of being the "Robocop" bad guy) go a long way to compensate for Lance Guest's blandness as the lead (Mark Hamill wasn't the most charismatic dude in "Star Wars" either, he needed his co-stars to bounce off from their personalities). And even though it's disappointing the commentary track with the filmmakers packs interesting behind-the-scenes nuggets of fun information. Catherine Mary Stuwart doesn't do anything for me (sorry Patrick). From a storytelling POV the movie has few surprises and it's practically a beat-for-beat screenwriter's 'how to' simple exercise in putting in their correct order the same elements that have been in 'hero' movies since the silent B&W days. So Sol, I'd say rent or stream "The Last Starfighter" to be safe but that this is a harmless and enjoyable 80's relic that still works if you adjust your expectations accordingly. I wouldn't buy it though unless you have a personal attachment to it. Otherwise I don't think the disc is coming out of anyone's shelf often-enough to justify the cost.